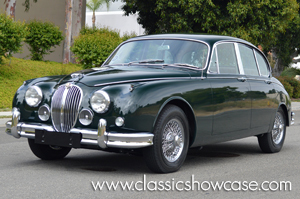 Classic Showcase has just wrapped up the restoration of this 1962 Jaguar Mark II Sedan to that of a campaign-worthy Show/Driver level. This is an original Arizona car that has been carefully stored in Southern California since the early 70s, and has received a fresh respray to a highly desirable color of British Racing Green, complimented by a Tan custom tailored and fit interior produced by master Trimmers in our Upholstery department. Included in the Sedan’s restoration process, the car has been stripped to bare metal and placed on a rotisserie, its metal was finished, and leaded. All body parts were fitted to the car and chrome, then prepared for primer, sealer, paint, base, and clear, and was color sanded and buffed to a fabulous finish. All systems were gone through, and the engine was rebuilt back to factory specifications. The car's fuel, electrical, cooling, and hydraulic systems were restored as well, along with the addition of a new wire loom to the car. Inside the MKII's cabin, all the wood has been completely restored to that of a very high level, further accentuating the high level of craftsmanship already evident in the car. All major mechanical components were rebuilt back to factory specifications including the engine, transmission, rear end and suspension, and all of the Sedan's chrome will be re-plated where needed as well. This Mark II is not only a great example to drive and enjoy, but could be a fierce contender in local and regional classic Jaguar shows and events. Adhering to William Lyons' maxim of "grace, pace and space", the Mark II was a beautiful, fast and capable saloon car. 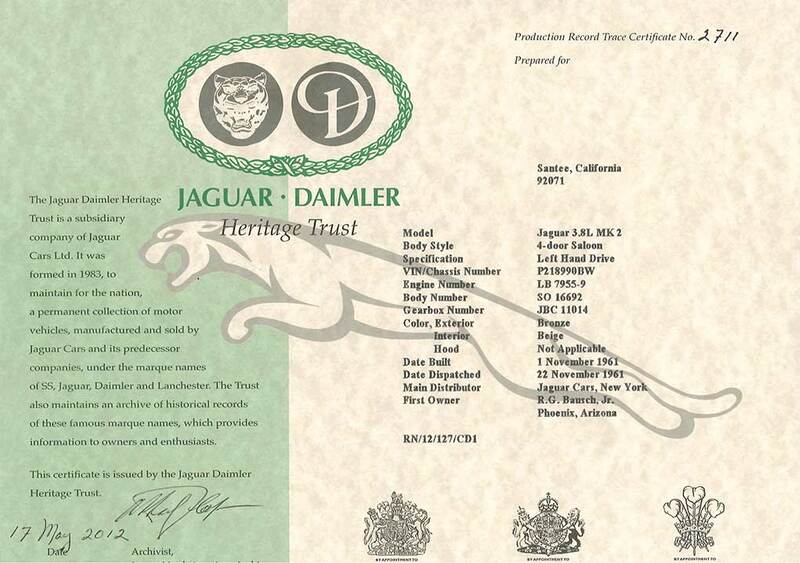 It came with a 2.4 L, 3.4 L or 3.8 L Jaguar XK6 engine. The 3.8 is similar to the unit used in the 3.8 E-Type (XKE), having a different inlet manifold and carburetion (two SUs versus three on the E-Type in Europe) and therefore 30 bhp less. The head of the six cylinder engine in the E-Type was also different with its "straight port" layout as opposed to the slightly curved ports of the Mark II. The Mark II model was raced successfully in the European Touring Car Championship.